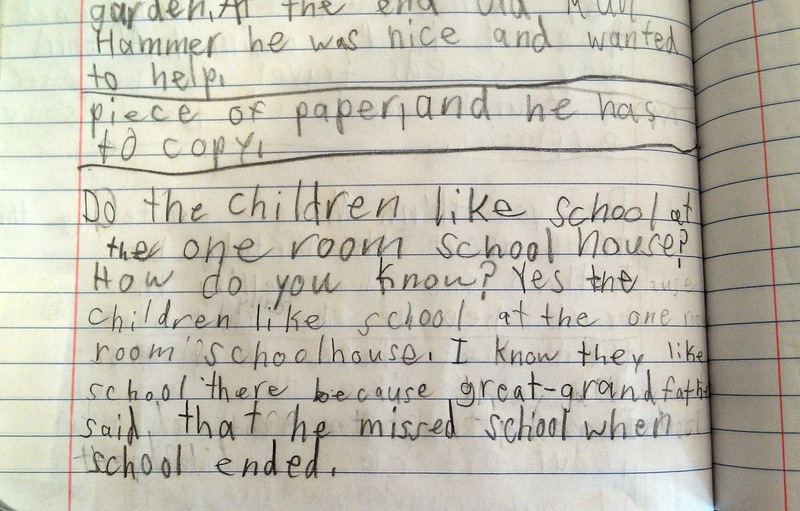 I recently DRA'ed my third graders and realized that some of them were lacking in the inference department. As a result, I developed the lesson below! In my typical style, I began with an anchor chart. Firs,t we went over the meaning of an inference together, and students glued a copy of the chart into their reader's notebooks. Then, I began the modeling portion of the lesson by reading aloud The Sweetest Fig . If you have not read this book, you need to! The kids absolutely loved this book. They were really upset that the school library did not have a copy. In this book, a man has two figs that will make your dreams come true. With the first fig, he did not fully understand its power, but he vowed not to make the same mistake with the second fig. The ending is fantastic, but I won't spoil it for you. I had already selected four text clues from the text and written them on the anchor chart. As I read aloud, we paused and recorded our inferences on the anchor chart. For the guided practice portion of the lesson, we used two of Shel Silverstein's poems. (This is based off of one of Debbie Miller's lessons.) I removed the titles of the poems before copying them. 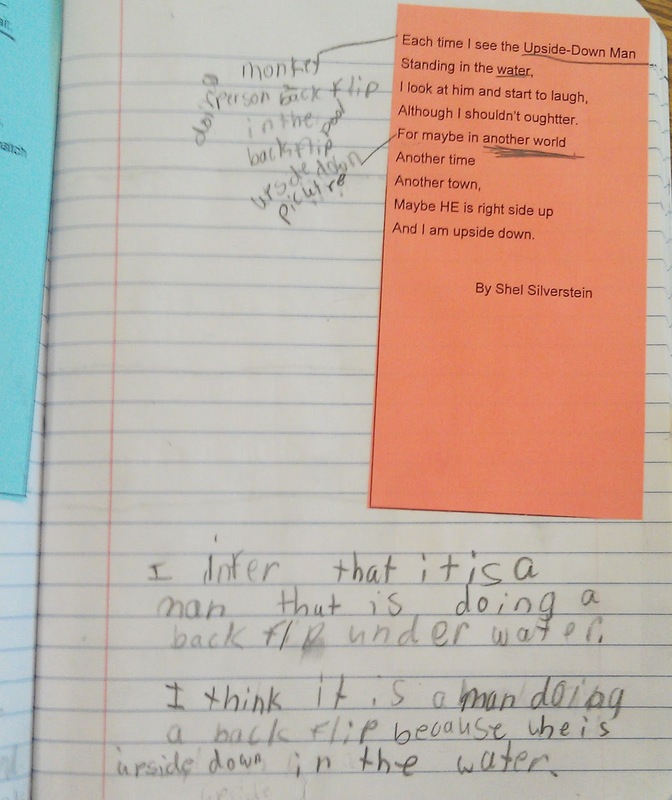 Students glued the poems into their reader's notebooks. 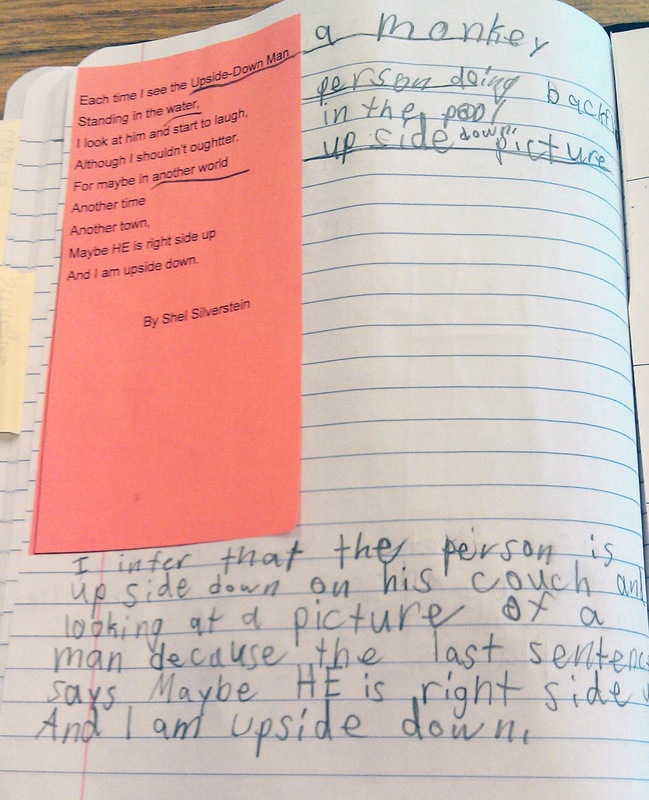 We used notecards to cover up the remainder of the poem as we went line by line. We paused every line or two to make inferences. 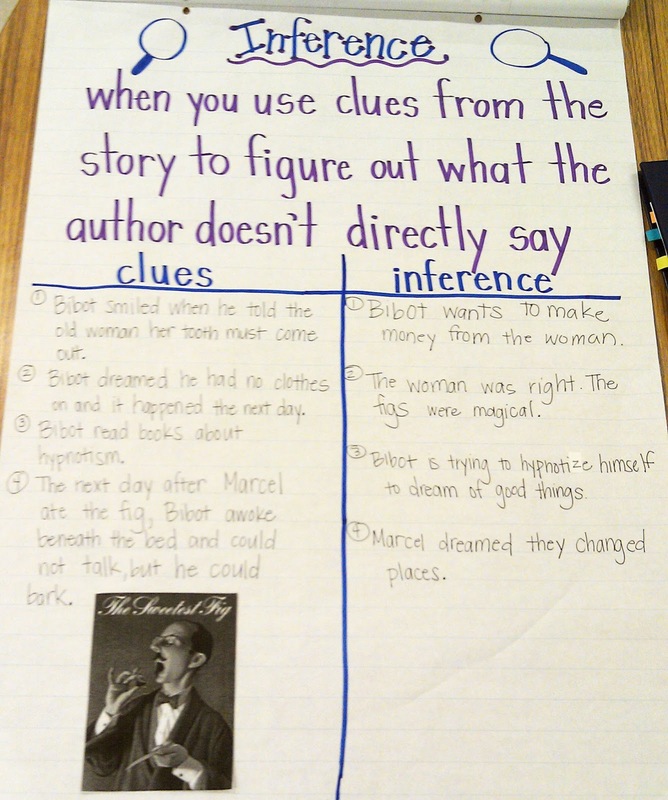 Students had to record their inference and underline the text clue that led them to their inference. When we had finished the entire poem, students made their final inference and provided their reasoning. I was surprised how much the kids loved this part of the lesson. They also came up with amazing inferences. 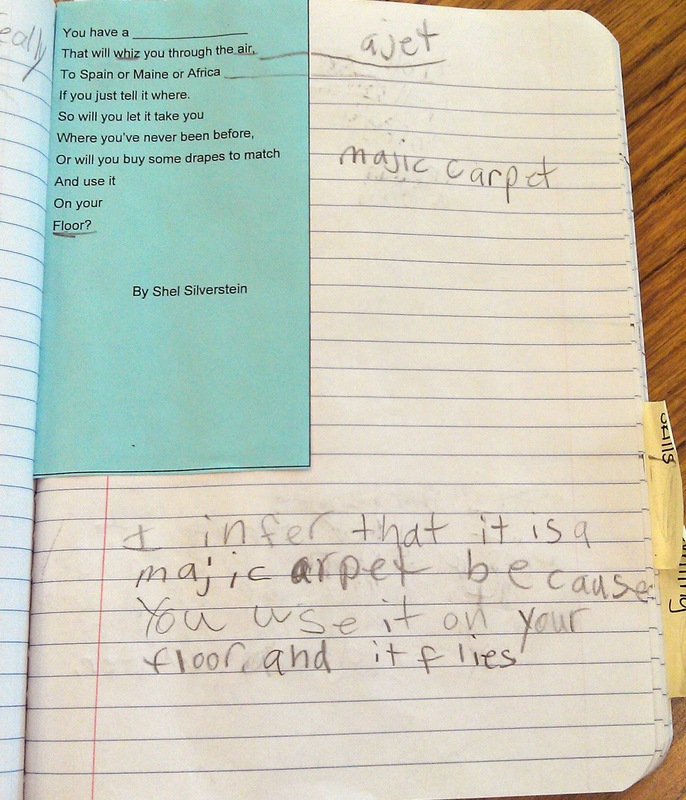 The poems I used by Shel Silverstein were Reflection and Magic Carpet. Click on the links to get your own copies of the poems! For the independent practice part of the lesson, students read Three Names . In this story, Great-Grandfather remembers his days in school with his dog Three Names. 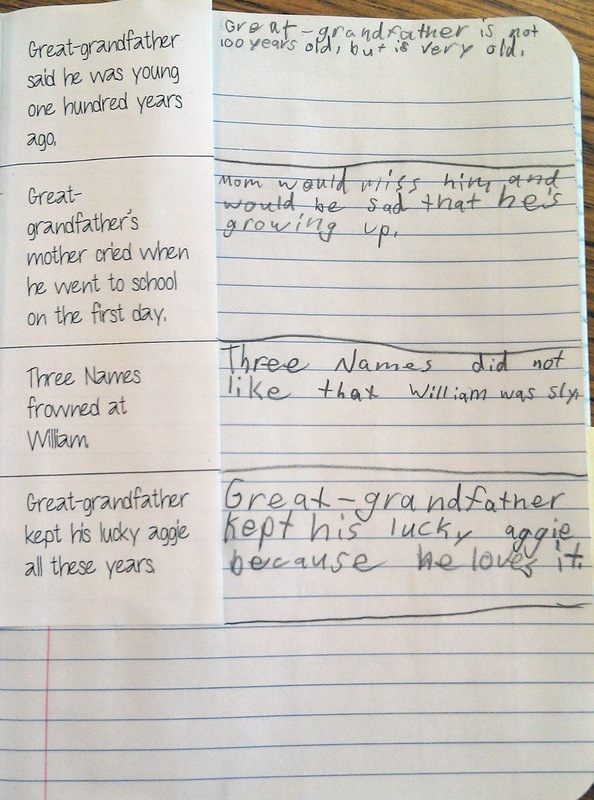 Students glued a set of text clues into their reader's notebooks. As they read, they recorded their inferences. If you would like a copy of the text clues for the story, click here! As a final assessment, I had students complete a written response question requiring them to infer and provide support from the text. I hope you find something helpful! How do you teach and incorporate inferring into your classrooms? I've never read The Sweetest Fig. 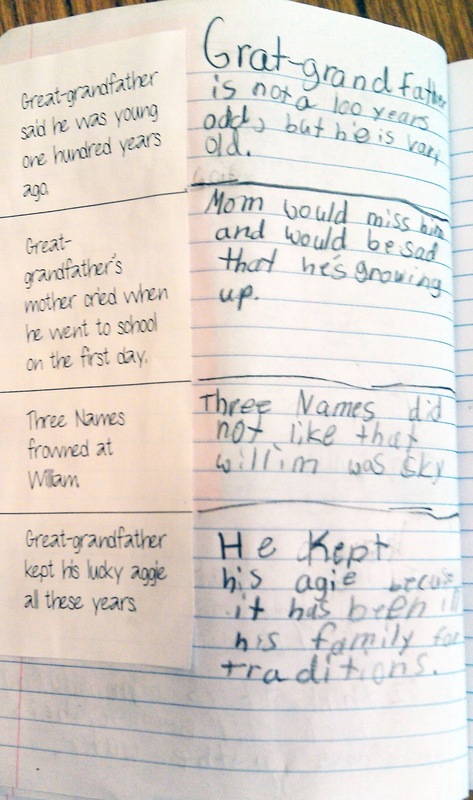 I like the idea of gluing a copy of the poem into their notebooks. I have done a lot of inferencing through read-alouds, but not much through close reading yet. It's on my to-do list! Thanks for the great resource suggestions. I like how they glued right into their notebooks too. I like starting an inferencing unit with concrete examples: what's in the garbage (a carefully constructed garbage sample! ), what's in the bag (gift bag), items in a suitcase, what's in their desk/backpack etc. Glad to be a new follower of your blog. I'm a teacher candidate and was searching for ideas to build inferencing skills - Now I've found one. Thank you for sharing! !